But, here’s the cool thing: when a binding agent, like borax, is added to guar gum in solution, it will bind to itself, trapping liquids between the long molecules. 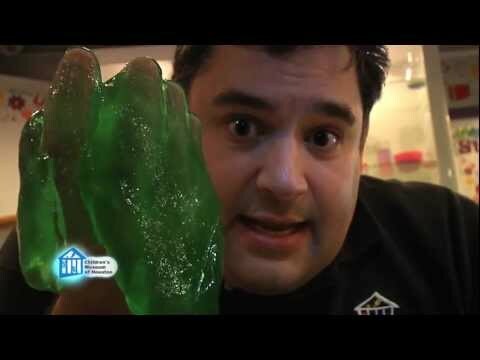 This is called cross-linking and is the key to making great, gelatinous slime! Add the borax to 5 teaspoons of hot water. Stir thoroughly. SLOWLY add in the powered guar gum over about 5 minutes while stirring constantly. CAUTION – If you dump all of it in, it will clump together and you won’t get your slime! Congratulations! You made a colloid! A colloid is when one substance is distributed evenly throughout another substance, but they aren’t dissolved or chemically combined. In this case, the borax reacts with the guar gum to create a mesh of molecules that trap the water and coloring throughout it, creating a gel! A gel is one type of colloid. Other examples include alloys (like stainless steel), aerosols, and foams.